Get these essential kitchen tools for Indian cooking so that you can make Indian food at home! For those who are new to Indian cooking, don’t worry you don’t need a ton of special equipment to cook Indian food. As you scroll through the list, you will notice that you already have most of the tools at home, if you have been already cooking any kind of food at home. As you get more experienced in Indian cooking, you can invest in a few items as you go along but for the most part, you don’t have to invest in a crazy amount of kitchen equipment. If you have been cooking for a while, I am assuming you already have the following kitchen items. Dinner Plates – I recommend Corelle instead of stoneware since it is lighter. Knife – Every budding chef’s dream is to have a quality knife in their arsenal and this 6-inch all-purpose Chef’s knife from Wusthof does any job well. It is very comfortable to hold and makes chopping feel less of a chore. Chopping board – It is best to separate chopping boards for veggies and meat. That’s why I like Index™ with knives from Joseph Joseph. This set includes four color-coded cutting boards with four corresponding knives to help reduce cross-contamination and make food preparation even easier. Kadhai / Wok – I have 2 of them – T-Fal one for stir-frying and the Futura brand to make curries. I would think one would be sufficient, to begin with. If you want something long lasting, go for Anolon chef’s casserole. Blender – I will be lost without my Blendtec blender. From idli batters to banana bread and even sambar powder, I use this one blender for everything. Frying / Pan – Always keep two separate frying pans for dosas and chapatis. I prefer cast-iron ones for chapatis whereas non-stick for dosas. Lemon squeezer – To add a bit of tang to your meal, you need a lemon squeezer that will get every bit of juice out! Grater – There are many kinds – Zester / Box graters. I have a very simple box grater. It comes handy while making carrot halwa. Peeler – This Oxo one works great. Can opener – A can-opener is a must have according to me. Think about all those cans of coconut or condensed milk! Ice-cream scooper – for all you ice-cream lovers, an ice-cream scooper is a must! Now that we have some of the kitchen essentials out of our way, let’s look at the must-have kitchen tools for an Indian kitchen. In this list of 10 items, I would consider the top four as absolute essentials. 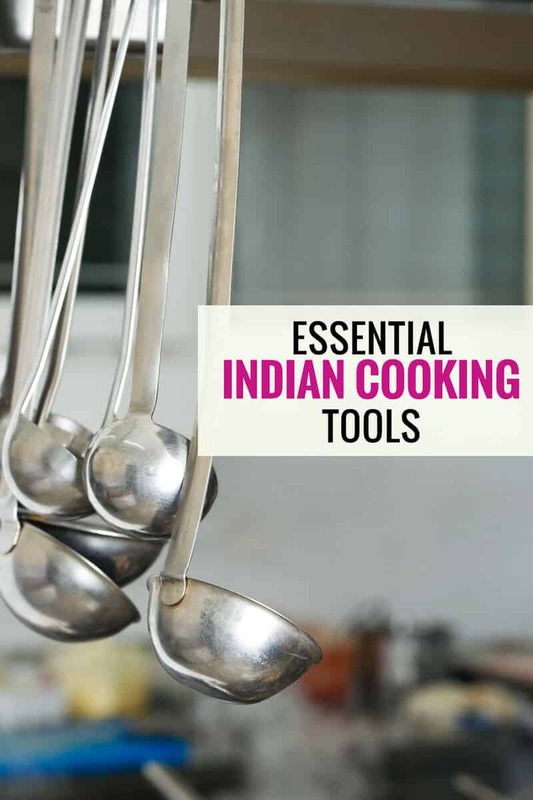 The rest of the tools in this list come handy when you want to make Indian flatbreads (roti) and idli at home. Pressure cooker – It is hard to imagine an Indian Kitchen without a pressure cooker. It is used to speed up cooking times for pulses, lentils amongst other things. If you live in a country where Instant Pot is available, then don’t even think of buying any other cooker (read here to know why). If Instant Pot is not an option then Hawkins is a good alternative. Masala dabba / spice rack – You can find some really pretty ones from World Market but if you want something functional, get this masala dabba (spice rack) from Amazon. Mortar / Pestle – A mortar and a pestle can come handy when you want to quickly powder spices. Tadka pan / mini fry pan – These are perfect for tempering those delicious curries you’ll be making. Saucepan – A saucepan is perfect for making tea or coffee on your stovetop. Strainer – All you tea lovers, what would you do without a strainer? Chakla / Belan (Circular board and rolling pin) – if you can or are planning to make chapatis / phulkas you need Chakla and Belan. The ones I found online were outrageously expensive and not rated well. I think this kitchen equipment is best bought in Indian stores. Tongs – Chimta or Tongs is an essential tool in the kitchen especially while making rotis. Pincer – This tool comes handy when you need to handle hot pans and pots. Idly Stand / Idly Cooker -If you don’t want to go for an Idly Cooker, that’s fine; you could buy an Idly Stand that you can place in the cooker to get steamed idlis. I have used both but I will be honest the idlis in the Idli Cooker come out much better. Got any questions? Drop in a comment and let me know.